Greenland — a vast store of ice three kilometers tall at its center and the final remnant of the Northern Hemisphere’s great glaciers of the last ice age has now begun what is likely an unstoppable rush to the sea. For according to a new report in Nature Climate Change, the last stable region of glacial ice along the Greenland coastline is now accelerating through one of the ice sheet’s largest and deepest outlets — the Zachariae Ice Stream. The Zachariae Ice Stream is a vast river of ice in the northeast section of Greenland. It terminates in two outlets through a broad and deep ice-choked bay facing the Fram Strait. Throughout the 1990s and into the early 2000s, both warmer air and ocean water temperatures at the margins of Greenland began to speed up and destabilize glaciers all along Greenland’s southern, eastern and western coasts. But the northern glaciers remained relatively stalwart, continuing the rate of seaward motion observed over previous decades. Then, starting in 2003, something ominous began to happen. A combination of sea ice loss, warming air and ocean temperatures began to affect the northern edge of the great ice sheet. Its speed of forward motion through its outlet bays began to increase. By 2012, the great glaciers were dumping 10-20 billion tons, or roughly 10-20 cubic kilometers of ice into the ocean every single year. 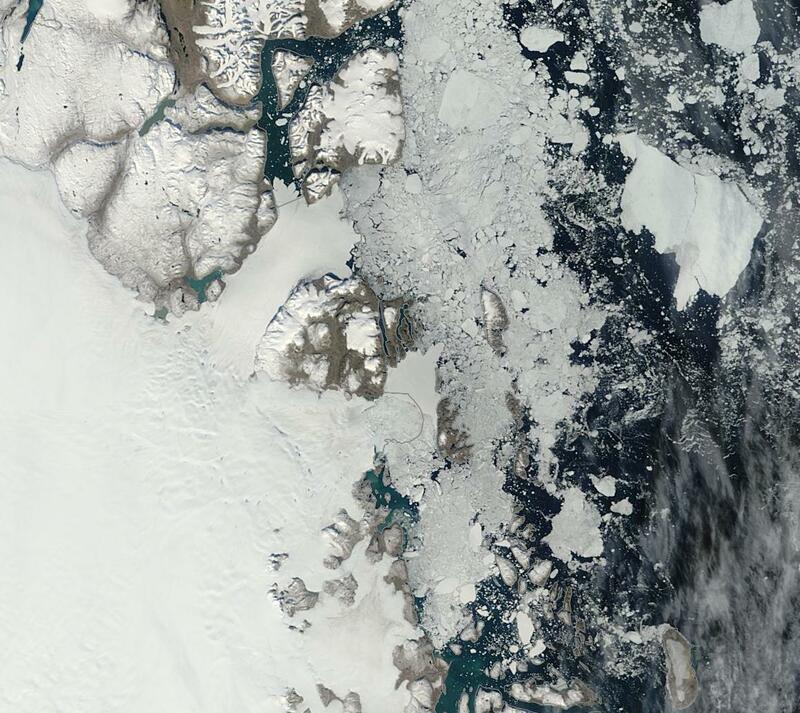 In just nine years the Zachariae Ice Stream had retreated a total of 20 kilometers toward the heart of Greenland. By comparison, the Jakobshavn Ice Stream, known to be Greenland’s fastest and located in South Greenland, has retreated 35 kilometers over the past 150 years. An ice stream drains an ice sheet the same way a river drains a watershed. So long as ice stream flow and rate of glacial recharge at the top of the glacier remains about equal, the ice sheet retains stability. But if the rate of ice stream flow and surface melt exceeds the rate of recharge, the glacier is said to have begun a difficult to reverse process called destabilization. The initiation of the great Zachariae Ice Stream’s destabilization is ominous for a number of reasons. First, it means the entire Greenland Ice Sheet has, as of the early 2000s, begun a plunge into the ocean that is likely unstoppable. 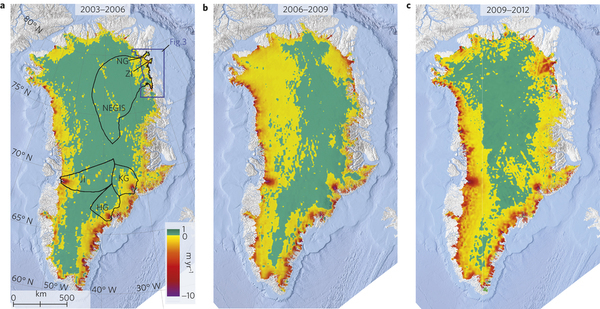 For once the great and massive glaciers of Greenland start to move, gravitational inertia sets in and even a radical cooling of the climate may not halt the surge. Furthermore, the Zachariae Ice Stream drains 16 percent of the entire Greenland ice sheet alone. 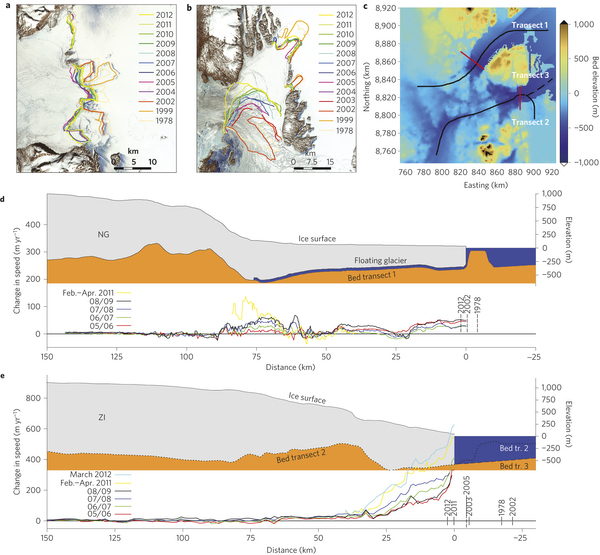 And finally, Zachariae stretches deep into the heart of Greenland, extending seven hundred kilometers inland and taking hold of Greenland’s massive central glaciers in its now accelerating ocean-ward draw. 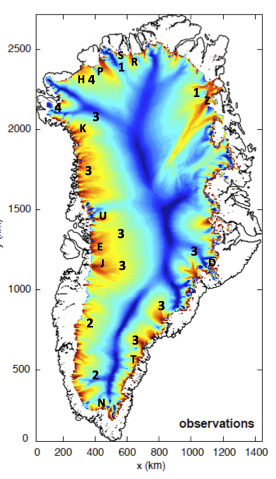 Margin melt and increasing velocity is an important indicator of overall stability throughout Greenland. For, during much of Greenland’s history, a more solid, less mobile ice margin has kept the central ice locked in. But like the collapsing edge of a plastic swimming pool, Greenland’s drooping margins are starting to let the central ice flows surge toward the coast line. Now the ice margin is destabilized in all the major edge zones leading to the initiation of the ice sheet’s draining. It is also worth noting that ice sheet motion is just one aspect of Greenland destabilization and a recent NASA paper shows that surface melt since 2009 has also rapidly accelerated. So the ice sheet is now a zone of accelerating glaciers and of annual surface melt all running more frequently and in ever greater volumes toward the swelling seas. The recent study involved the use of GPS modules scattered over top of the Greenland ice sheet to measure glacial speed, mass and altitude loss. This finding is the most recent study provided by the group’s network dubbed GNET. 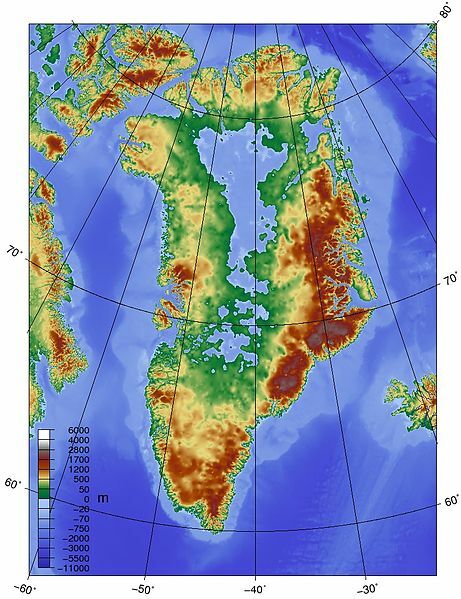 In understanding why Greenland’s ice sheets are likely to continue to flow into the ocean, it is useful to look at Greenland in its geological context. For Greenland is essentially an island archipelago with an enormous ice sheet sitting atop it. As such, great channels and fractures run deep into the heart of this frozen plcae. Many of these fractures are below sea level, providing ocean waters access further and further inland as Greenland melts. Furthermore, the high elevation of the ice sheet creates a kind of gravitational inertia that continuously drives glaciers toward the sea. Only friction from the anchoring ground beneath the glaciers, Greenland’s cold climate, and the chill of the surrounding airs and oceans provided Greenland with enough ice recharge while slowing the ice sheets enough to keep it stable during the last interglacial period (Holocene). Now, human warming is pulling that plug by flushing melt water to the ice sheet’s base, creating warmer ocean water invasions at the ice edge and creating conditions by which warm air increasingly both overrides the ice sheet edge and invades into the ice sheet interior. Current atmospheric conditions now provide enough greenhouse gas forcing to destabilize ice sheets in both Greenland and West Antarctica. These levels, at around 400 ppm CO2 and at around at least 425 CO2e when taking into account all the additional negative and positive forcing from aerosols and other greenhouse gasses, were enough in past climates to send these immense regions of ice plunging into the world ocean and to raise sea levels by between 15 and 115 feet over the course of centuries (Greenland alone contains enough water locked in its ice sheets to raise sea levels by about 23 feet). All of the Greenland ice sheet and large sections of West Antarctica are now undergoing the first stages of a similar destabilization. Today’s pace of sea level rise is currently 3.2 millimeters each year or a little more than a foot each century. Of this total, fully 1/6th is now being contributed by Greenland. But with inertia and gravitational forces now taking hold as massive ice sheets destabilize, and with human-caused warming continuing to ramp up, it is likely that we can expect both the Greenland ice sheet’s contribution and the pace of sea level rise to rapidly accelerate. As the great ice sheets sped toward the oceans at the end of the last ice age, the pace of sea level rise hit as high as 10 feet each century. With the pace of human warming now about 30 times faster than at the last ice age’s fall, we may well eventually witness something even outside this difficult to understand context. Even more ominous is the fact that greenhouse gas forcing levels that are enough to destabilize and then melt all the world’s ice sheets, eventually raising seas by about 250 feet, arrive as soon as the next few decades once CO2 (or equivalent) forcing levels hit between 500 and 600 parts per million value. The current rate of emission gets us there within about 20 years. But, unfortunately, that rate of emission is still rising even as amplifying feedbacks from terrestrial carbon stores in both the Arctic and the tropics loom. In essence, it looks more and more, from the point of ice sheet stability, like we’ve probably at least locked in a Heinrich type event and will be well on our way to initiating total ice sheet loss over the coming two decades.